Showing items in category B.I.O.T., sorted by newest listed first. B.I.O.T. - 1968 Rs10 U/M example showing the MISSING STOP AFTER I. SG 15B. 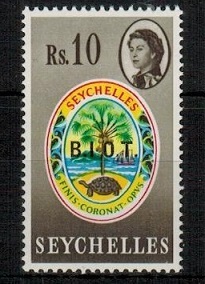 1968 Rs10 'Colony's Badge' adhesive of Seychelles overprinted 'B.I.O.T.' in fine unmounted mint condition with major variety MISSING STOP AFTER I. (Very faint impression). Row 4/3. SG 15b. B.I.O.T. - 1968 Rs10 U/M pair with MISSING STOP AFTER B. SG 15A. 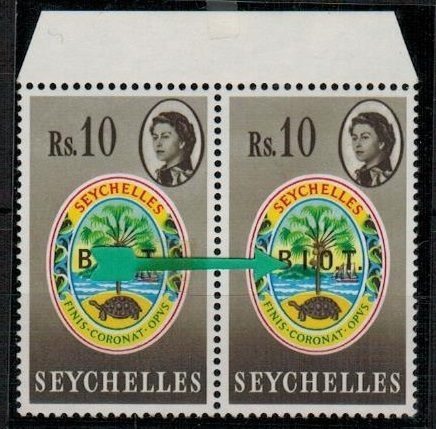 1968 Rs10 'Colony's Badge' adhesive of Seychelles overprinted 'B.I.O.T.' in fine unmounted mint pair with major variety MISSING STOP AFTER B. Row 1/8. SG 15a. B.I.O.T. - 1968 Rs5 U/M pair with MISSING STOP AFTER O. SG 14b. 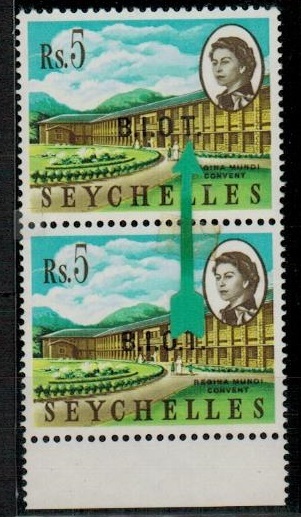 1968 Rs5 'Reginia Mundi Convent' adhesive of Seychelles overprinted 'B.I.O.T.' in fine unmounted mint bottom marginal vertical pair with major variety MISSING STOP AFTER O. SG 14b. B.I.O.T. - 1968 Rs2.50 U/M pair with MISSING STOP AFTER O. SG 12b. 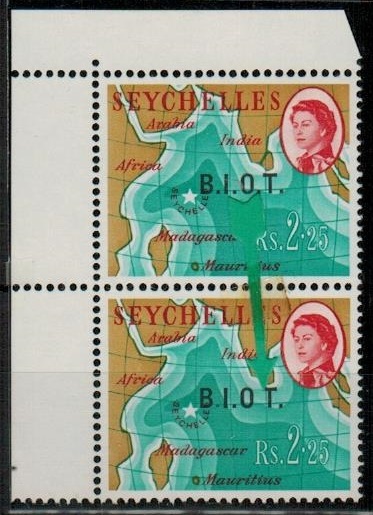 1968 Rs2.50 'Map' adhesive of Seychelles overprinted 'B.I.O.T.' in fine unmounted mint vertical marginal pair with major variety MISSING STOP AFTER O. SG 12b. B.I.O.T. - 1968 40c U/M pair with MISSING STOP AFTER O. SG 6b. 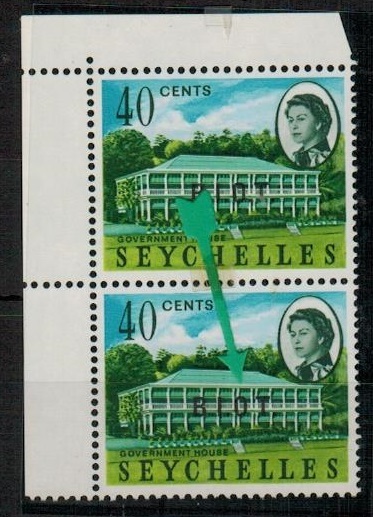 1968 40c 'Government House' adhesive of Seychelles overprinted 'B.I.O.T.' in fine unmounted mint vertical marginal pair with major variety MISSING STOP AFTER O. Row 2/1/ SG 6b. B.I.O.T. 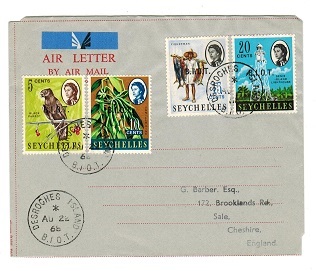 - 1968 philatelic use of FORMULA air letter to UK from FARQUHAR ISLAND. B.I.O.T. - 1968 (OC.18.) use of red on greyish 'Formula' type AIR LETTER addressed to UK (no message) bearing 5c,10c,15c and 20c adhesives overprinted B.I.O.T. tied by various FARQUHAR ISLAND/B.I.O.T. cds's struck in violet ink. B.I.O.T. 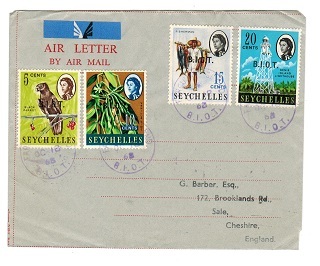 - 1968 philatelic use of FORMULA air letter to UK from DESROCHES ISLAND. B.I.O.T. - 1968 (AU.22.) use of red on greyish 'Formula' type AIR LETTER addressed to UK (no message) bearing 5c,10c,15c and 20c adhesives overprinted B.I.O.T. tied by various DESROCHES ISLAND/B.I.O.T. cds's.